Steven Universe, the first CN show directed by a woman, Rebecca Sugar (Adventure Time), has completed its fifth season this year, giving an excuse to dwell in its gender norms and LGBT agenda. 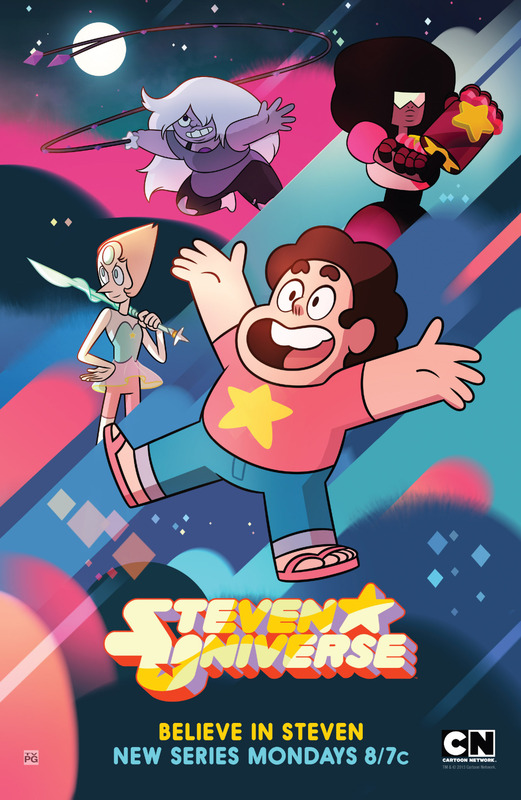 To rapidly summarise, Steven is a young half-human, half-gem teenager who lives with the Crystal Gems, aliens seen as women on Earth, who swore to protect our planet. Steven Universe presents its spectator with a range of LGBT characters inspired by Sugar’s own experience as a non-binary woman: a planet of non-binary protagonists often gay or bisexual, a gay marriage in ‘Reunited’, transgenders in ‘Jungle Moon’ or violence and non-consensual relationships in ‘Jailbreak’. All those subjects are particularly admirable in a kids’ show, and I would like to focus on the depiction of masculinity and femininity. As we are aware, male characters in mainstream cinema are often depicted as strong, emotionless characters. At the contrary, female characters are often supporting characters and love interests struggling to pass the Bechdel test. Recently, there is a tendency to represent women as superheroes in the way men have been represented, powerful and flawless, but also rejecting everything that would refer to the stereotyped idea of femininity, crying for example. This does present spectators with an ideal to identify with and in that sense is beneficial. However, I believe there is a need to represent more women as flawed heroes and with the possibility of liking what is associated with femininity in the same way that men should be represented in that way. Steven Universe is a perfect example of this idea. In fact, Steven starts out as young, clumsy, new Crystal Gem. He is depicted as unsure of himself and unable to use his powers. Often in the series, he questions his affiliation to the Crystal Gems as they seem overpowered compared to him. Moreover, when Steven finally gets his powers, he can summon a shield and has healing power unlike the Crystal Gems who all have weapons. Steven is also seen struggling to understand his relation to his mother, who had to pass away to have a child as Gems cannot generally have children. In the episode ‘Sadie’s Song’, Steven encourages Sadie to wear a dress and make-up but as he understands that was never what she wanted (she is really a horror punk singer), he takes her place and wears both the dress and starry make-up. Steven is therefore represented wearing traditional feminine elements, but the sequence is not made to laugh at him but rather to understand that stereotypes only imprison people. Finally, in ‘Mindful education’, Steven learns how crying is a good thing. Masculinity is therefore represented in a really different way from mainstream cinema with doubts, emotions and also shows that boys can take female role models and vice versa. Concerning female characters, they are represented as strong, independent characters however instead of taking on a classical male representation of flawlessness, they are also seen as sensible characters. In the series, the most powerful Gems are the Diamonds. One of them, Yellow, is the most “masculine” in the traditional sense, however during the song ‘What’s the Use of Feeling Blue?’, we understand that she cannot be emotionless, and she is grieving too. Steven Universe shows us that women can be represented as strong and still enjoy what is usually associated with femininity, emotions or the colour pink! To conclude, Steven Universe simply shows us that gender is not what defines someone or his/her tastes and that we are free to choose. An extraordinary show for all ages!